The AMDR market is estimated to be valued at USD 8.79 Billion in 2016 and is projected to reach USD 12.52 Billion by 2021, at a CAGR of 7.34% from 2016 to 2021. The report considers the following segments to define, describe, and forecast the AMDR market: By Platform (ground-based, naval-based, airborne), By Range (short range, medium range and long range strategic system), By Application (conventional and ballistic missile defense) and By Region (North America, Europe, Asia-Pacific, Middle East and Africa, Rest of the World). Years considered for this study are 2014 as the base year and the projections are made up to 2021. Radars play a vital role in the defense industry. For instance, the United States has an elaborate ballistic missile early warning system (BMEWS) to detect incoming missiles. Multifunctional radars are the upcoming technological advancements in the surveillance industry that have huge potential to drive this market globally. The ecosystem of the AMDR market comprises defense establishments, aerospace industry, and AMDR radar manufacturers’ facilities, among other. This report would help the AMDR system suppliers, army, navy, air force, government and regulatory authorities to identify hot revenue pockets in this market. The global air and missile defence radar (AMDR) market was valued at USD 8.79 Billion in 2016 and is projected to reach USD 12.52 Billion by 2021, at a CAGR of 7.34% from 2016 to 2021. Increased concerns towards prevention from ballistic and stealth missiles, target racking and early warning, airborne fire control, surveillance, and ground mapping, among others, are driving the demand for AMDRs across the globe. 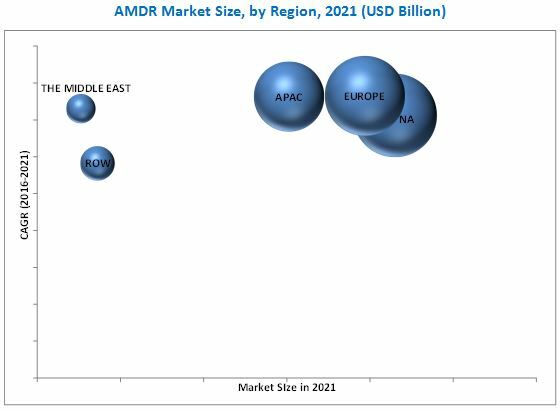 Ground-based AMDRs have the largest share in the global AMDR market in 2016. These systems are mostly used for military and homeland security application. X-band and S-band radars are widely used for ground-based AMDR application, whereas naval radars are used for naval surveillance and target detection, such as ballistic 7 stealth missile, and long range artilleries, among others. These systems are also used for monitoring drug trafficking, smuggling, piracy, illicit fishing, and terrorism. Airborne AMDR systems are widely used for air space surveillance, intrusion detection, early warning systems, and missile defence application. The global air and missile defense radar market, on the basis of region, is dominated by North American countries that include the U.S. and Canada. North America has the highest share in the global AMDR market. High demand for air surveillance systems, and air and missile defence radars in the U.S. is majorly driven by the AMDR program, the three dimensional expeditionary long range radar (3DELRR) program, space fence program, procurement of AN/TPS- 59, AN/TPS-63, And AN/TPS- 80 radar systems, and the acoustic rapid COTS Insertion (A - RCI) program. New-age war tactics present numerous challenges for automation of AMDR systems. AMDR systems are not fool-proof. Cyber hacking of fully automated AMDRs may result in unrecoverable damage to critical infrastructure and country security. False signals may prevent from detection of actual targets, such as ballistic and stealth missiles adding to the challenge. Communication loss, scrambled pilot radios and information stealing are the probable outcomes of a cyberattack. Basically, Lockheed Martin stands as one of the world's premier companies in aerospace, defence, security, and technologies industry. It is world's largest defence contractor. Lockheed Martin operates in five business segments namely, aeronautics, information systems and global solutions, missiles and fire control, mission systems and training, and space systems. Its space and defence solutions, including advanced missile defense systems, naval systems, radar systems, electronic warfare and unmanned system, among others, offer high-quality security capabilities to their customers across the globe. The major competitors of Lockheed Martin are Israel Aerospace Industries, Boeing, Raytheon, General Dynamics, Northrop Grumman Inc., Reutech Radar Ltd (South Africa), among others.